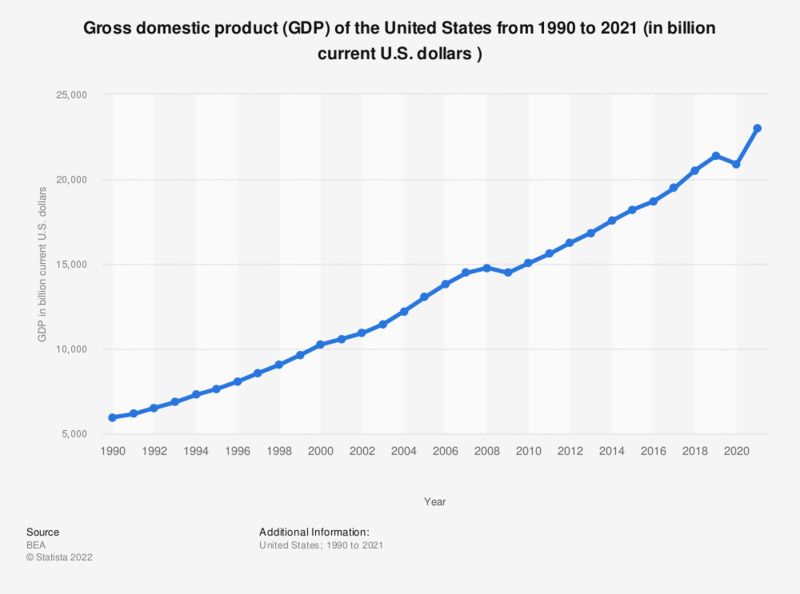 This statistic shows the development of the gross domestic product of the United States of America from 1990 to 2018. Gross domestic product (GDP) refers to the market value of all goods and services produced within a country. The U.S. GDP increased to about 20.5 trillion U.S. dollars in 2018. The annual growth rate of the Real GDP can be found here. Currently, the United States is ranked first in the world GDP ranking. See, for example, the Russian GDP for comparison. The gross domestic product (GDP) is one of the most important indicators used to analyze the health of an economy. GDP is defined by the BEA as the market value of goods and services produced by labor and property in the United States, regardless of nationality. It is the primary measure of U.S. production. The OECD defines GDP as an aggregate measure of production equal to the sum of the gross values added of all resident, institutional units engaged in production (plus any taxes, and minus any subsidies, on products not included in the value of their outputs). Although the United States had the highest Gross Domestic Product (GDP) in the world in 2017, the national debts of the United States are rising steadily. The national debt of the United States amounted to 16,707.32 billion U.S. dollars in 2012 and grew up to 20,498.52 billion U.S. dollars in 2017. A ranking of individual state debt in the United States shows that California is the state with the highest amount of debt in the United States, while New York was on rank 2, New York’s debt amounted to 387.47 billion U.S. dollars. Vermont, North Dakota and South Dakota are the states with the lowest amount of debt. The U.S. government receives a part of its budget from taxpayers. According to the U.S. Census Bureau, the American government’s tax revenue was about 911.7 billion U.S. dollars in 2015. Since 2002, the total amounts of the receipts are lower than the amount of the outlays of the United States and the U.S. Office of Management and Budget forecast that the gap between the receipts and outlays of the United States will not close until 2019. The result of this development is that the U.S. won't be able to reduce the national debt within the coming decade.